This is a great use for leftovers. If you’ve got ANY kind of cooked meat in the refrigerator, as well as some brown rice (or even cous cous or quinoa), you could easily transform it into some version of this salad. I’ve generally done it with leftover ground turkey or beef, but anything — even meatloaf — would be just fine. You could also, if you’d prefer, wrap all of this up into a tortilla and send it as a burrito, but I don’t think it’s necessary. In a small bowl, mix together the rice, meat, corn, tomatoes, and cheese (if using). In a blender, combine the salsa, olive oil, and lemon juice until they make a smooth dressing. Pour the dressing over the rice mixture and stir to coat evenly. 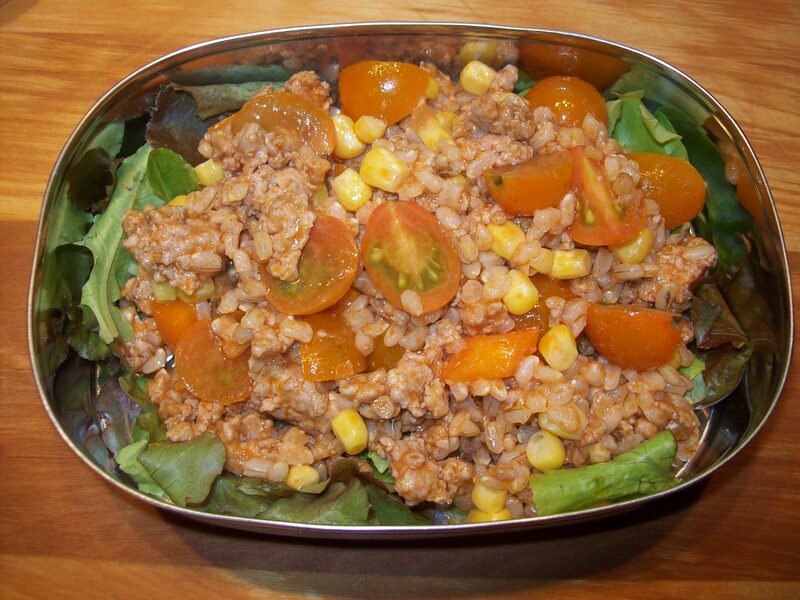 Place the salad greens in your lunch container and top with the rice mixture.